The Great Unwashed (AKA The Clean) lauded Duane Eddy, king of the twangy guitar. 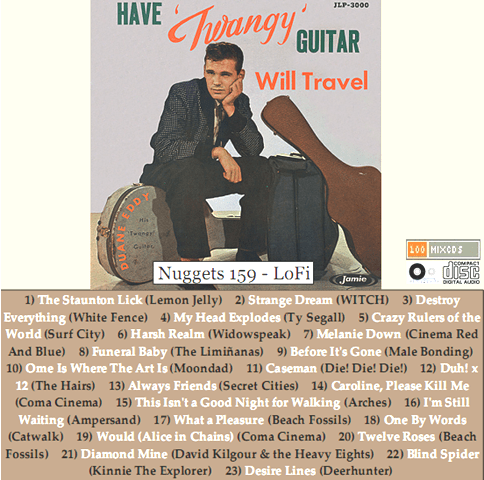 Here is a twangy mix. haven’t finished adding links etc., soon. 1) The Staunton Lick (Lemon Jelly) 2) Strange Dream (WITCH) Second outing on a Nugget for this Zambian psychedelic band from the 70’s. 3) Destroy Everything (White Fence) More trippyness 4) My Head Explodes (Ty Segall) Off a single shared with Jeff The Brotherhood. 5) Crazy Rulers of the World (Surf City) 6) Harsh Realm (Widowspeak) Hope Sandoval sound a like from Brooklyn 7) Melanie Down (Cinema Red And Blue) Hamish Kilgour et al. 8) Funeral Baby (The Limiñanas) Was going to include the Bats so I covered off all the members of the Clean, but why listen to Rob Scott when you can have the French version? 9) Before It’s Gone (Male Bonding) Shop assistants break out. 10) Ome Is Where The Art Is (Moondad) AKA The loudest band in Leicester. Get the rest of their songs for free. 11) Caseman (Die! Die! Die!) On tour, appear to be on their way to Turkey. I am looking forward to catching them when back in NZ. 12) Duh! x 12 (The Hairs) 13) Always Friends (Secret Cities) 14) Caroline, Please Kill Me (Coma Cinema) 15) This Isn’t a Good Night for Walking (Arches) 16) I’m Still Waiting (Ampersand) 17) What a Pleasure (Beach Fossils) From their new album, now on Emusic. Comfort food for the ears. 18) One By Words (Catwalk) 19) Would (Alice in Chains) (Coma Cinema) 20) Twelve Roses (Beach Fossils) Their latest album also on Emusic. 21) Diamond Mine (David Kilgour & the Heavy Eights) The rest of the Clean. 22) Blind Spider (Kinnie The Explorer) 23) Desire Lines (Deerhunter) wonderful.